Rotator cuff tears are a common cause of shoulder pain. There is an absence of information about symptomatic rotator cuffs from the patients’ perspective; this limits the information clinicians can share with patients and the information that patients can access via sources such as the internet. This study describes the experiences of people with a symptomatic rotator cuff, their symptoms, the impact upon their daily lives and the coping strategies utilised by study participants. 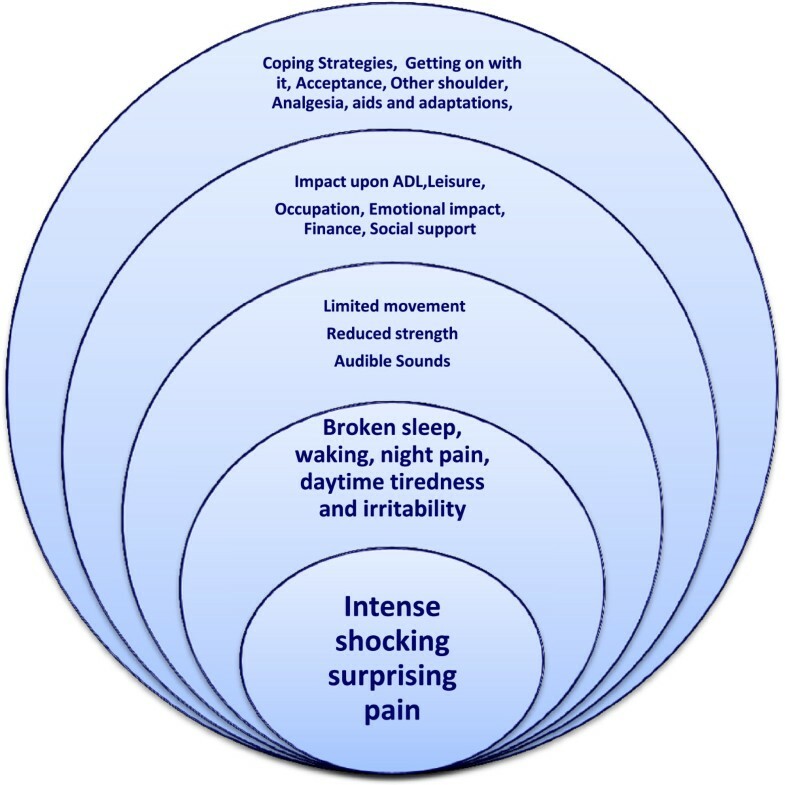 An interpretive phenomenological analysis approach was used. 20 participants of the UKUFF trial (The United Kingdom Rotator Cuff Surgery Trial) agreed to participate in in-depth semi-structured interviews about their experiences about living with a symptomatic rotator cuff tear. Interviews were digitally recorded and fully transcribed. Field notes, memos and a reflexive diary were used. Data was coded in accordance with interpretive phenomenological analysis. Peer review, code-recode audits and constant comparison of data, codes and categories occurred throughout. The majority of patients described intense pain and severely disturbed sleep. Limited movement and reduced muscle strength were described by some participants. The predominantly adverse impact that a symptomatic rotator cuff tear had upon activities of daily living, leisure activities and occupation was described. The emotional and financial impact and impact upon caring roles were detailed. Coping strategies included attempting to carry on as normally as possible, accepting their condition, using their other arm, using analgesics, aids and adaptions. Clinicians need to appreciate and understand the intensity and shocking nature of pain that may be experienced by participants with known rotator cuff tears and understand the detrimental impact tears can have upon all areas of patient’s lives. Clinicians also need to be aware of the potential emotional impact caused by cuff tears and to ensure that patients needing help for conditions such as depression are speedily identified and provided with support, explanation and appropriate treatment. Around 1% of adults aged over 45 years consult their General Practitioner for a new shoulder problem annually; estimations of shoulder pain prevalence range from 4-26%, and rotator cuff problems account for more than two thirds of cases. Shoulder problems are often long term; the majority of people referred to primary care with first episode shoulder pain remain symptomatic one month later and 41% experience persistent symptoms at twelve months. Rotator cuff tears increase with age and may be symptomatic or asymptomatic. 26.2%-38.9% of rotator cuff tears demonstrated during radiological investigations of the shoulder are asymptomatic, although tears may become symptomatic over time. Economically, in addition to health care consultation and treatment costs, work related upper limb disorders in the UK are now more prevalent than back pain. The rotator cuff is a critical component of shoulder function and for the successful completion of manual tasks requiring the ability to position the hand precisely in space, particularly when the arm is away from the body. There is a lack of concensus regarding the optimal treatment of degenerate cuff tears and limited and inconclusive evidence regarding the relative effectiveness and harms of surgical and conservative treatment approaches[1, 7, 8]. Non-operative management such as physiotherapy is recommended prior to considering surgery but surgical referral criteria are not straightforward[9, 10]. The need for further research was highlighted at a recent consensus meeting on the management of disorders of the rotator cuff which identified 30 unresolved issues/areas for future research to improve management. There is also an absence of information about symptomatic rotator cuff tears from the patients’ perspective which limits the information clinicians can share with patients. The value of qualitative research to improve understanding of patients’ experiences, and of the complex processes involved in treatment outcomes, is well recognized and accepted. One recent Finnish study describes the experience of patients’ diagnosed with supraspinatus tendonitis problems, reporting pain as the predominant attribute of shoulder problems (six focus groups, three pre and three post different types of treatment (n = 21) individuals). More widely, reports include a study briefly exploring patients’ experiences of frozen shoulder and treatment via the Bowen technique, a reflection upon the importance of the interpersonal nexus within qualitative research processes with patients undergoing shoulder surgery and a study of patients’ perceptions and priorities regarding frozen shoulder. However, qualitative research regarding rotator cuff tears remains highly limited. The United Kingdom Rotator Cuff Surgery Trial (UKUFF) was funded by the NIHR Health Technology Assessment Programme to examine the clinical and cost effectiveness of different surgical techniques versus non-surgical treatment for rotator cuff tears. A qualitative study was undertaken to explore UKUFF participants’ experiences of having a known rotator cuff tear and to explore their treatment decision making experiences and outcome. This article aims to describe the experiences of people with a known rotator cuff tear, their symptoms and the impact upon their daily lives and the coping strategies utilised by participants. A qualitative study using an interpretive phenomenological analysis (IPA) approach. Ethical approval for the study was granted by NRES committee North East - Northern and Yorkshire (ref no: 12/NE/0052) and included obtaining written consent from participants for the publication of their data. Potentially eligible patients were identified by the UKUFF trial team. The inclusion criteria for the UKUFF trial specified patients with full thickness degenerative tears, without trauma, were eligible for inclusion. No patient had an isolated subscapularis tear. Data collected upon trial entry were used to invite participants with a range of Oxford Shoulder Scores, trial arm allocations, treatments and outcomes. UKUFF participants are English speaking patients aged over 50 with a rotator cuff tear (diagnosed by ultrasound or MRI scanning). Potential participants were posted an invitation by their local UKUFF site principal investigator. Interested patients contacted the study team directly by pre-paid reply slip, telephone or email (their preference) to discuss the study and, if willing, arrange an interview. Written informed consent was obtained pre- interview. Participant characteristics are presented (Table 1). Key: I/V = Interview, RCR = rotator cuff repair, SAD - sub acromial decompression, Acromioclavicular Joint excision = AC jt excision. Oxford Shoulder Score = OSS. A preliminary semi-structured interview guide was developed, following a literature review, by the researchers and an ex-shoulder patient (Table 2). Participants were invited to participate in in-depth semi-structured interviews at a time and venue of their choice. 18/20 interviews were held at participants home and two at conference meeting rooms between September 2012-April 2013. Participants were from across England and Wales, achieving a wide geographical and urban/rural spread. Visits ranged from 50 minutes to two and a half hours in duration, with taped interviews ranging from 28–101 minutes (average 45 minutes). Time was spent after the interviews in everyday conversation, allowing the interviewer (CML) to check the well being of the interviewee; interviews did not cause obvious distress. Interviews were digitally audio recorded and transcribed. Field notes, memos and a reflexive diary were recorded throughout. Participants were posted a summary of their transcript, providing opportunity to check quotations and views and remove anything with which they did not feel comfortable (member checking). No participant withdrew information, several added additional update comments or something they had remembered post-interview. Please tell me all about your rotator cuff tear/shoulder? (follow up questions to find out when and and how the tear happened and obtain narrative history from participant). Please tell me about how your shoulder tear affected/affects you? (follow up questions to explore impact upon activities of daily living, work, leisure, relationships, emotional impact, and to explore symptoms). Are you right or left handed? (follow up to explore dominance, unilateral or bilateral shoulder problems, “how is your other shoulder?”). Please tell me anything else you’d like to tell me about your shoulder and how the tear had affected you? Prompts were used to encourage conversational flow e.g. how did you feel about that? What happened then? Participants were able to introduce any new topics or issues into the interviews at any time and asked for any additional comments. Audio recordings were listened to and transcripts read until they become familiar. Data was coded in accordance with IPA. CML broke down interview data into discrete units and wrote these in the right hand margins of transcripts, making concerted efforts to remain close to the data and continually explore meaning. Units found to be conceptually similar were grouped together under more abstract categories and these written in the left hand transcript margins. NVIVO 9 software was used to assist data management. The process of constantly comparing data, codes and categories occurred throughout all analyses. The first three interviews were considered a pilot phase and the analyses discussed by all authors. The sampling approach was discussed at this point, and again after nine interviews. No changes in approach were considered necessary since a wide range of Oxford Shoulder scores, degree of tear and outcomes were being provided by participants. Further strategies to promote rigour, including peer review, code-recode audits, constant comparison of data, codes and categories occurred throughout. KB assisted in the peer review of emerging codes and categories; including independently coding a sample of the interview data (n = 8 full transcripts, including the pilot 3). Literature searches, to promote rich interpretation of the data, were incorporated in the analyses and writing up. There are three main sections: the identification and description of the symptoms caused by known rotator cuff tears, the impact that these tears had upon the lives of the participants followed by coping strategies that participants used to help them live with their rotator cuff tears. Figure 1 summarises the findings. Diagrammatic summary of living with a rotator cuff tear. This diagram shows how, like ripples spreading out from a stone thrown into a pool, pain from a symptomatic rotator cuff tear can impact upon, and change, all areas of a participant’s life. “if I do too much with it I think ‘Oh ****’, it’s afterwards it’s burning” (I/V7). Participants explained how the pain “was frightening” (I/V12) and lived with “the fear of that intense pain hitting you again” (I/V 12). “I was really tired. Yeah the lack of sleep…..there’s always pressure at work…..you start getting a little bit edgy, short tempered at times (I/V 5). “keeping my wife awake, I actually slept many times in the spare bedroom because she had to work? I’d go in the spare bedroom and sit there reading a book” (I/V6). The ability to sleep comfortably is lessened with symptomatic rotator cuff tear. The impact on sleep seems greater than reported by Nyman et al where sleep was disturbed “to varying degrees” but similar to reports of frozen shoulder[15, 13]. “I was struggling to use it…..I couldn’t put it (arm) above my head to do anything (Interviewer: Because of pain or because you didn’t have the movement?) Um, it was probably both actually…yes” (I/V20). Others recount movements feeling restricted or tight “it’s limited now (hand behind back) I can feel it” (I/V 14) and “I can feel a bit of pull there” (I/V 17). Rarely, movement was unaffected. One participant was “what we used to call double jointed” (I/V 8); she was flexible and maintained range of motion but experienced awful pain upon and after movement. “I do all my painting….to do a ceiling now I find difficult, because you are working over your head……I have to stop every five minutes to rest” (I/V16). Several participants mentioned the audible sound effects associated with their rotator cuff tear “just listen!” (I/V15), “sometimes I get a crunch, like if I go like that it clunks” (I/V 14), “it makes a creaking noise” (I/V18). Not all noises were painful, but were a reminder of their shoulder problem, although a few participants equated worsening sound effects with progression of their condition “now it’s started to do it (crunch) down here as well” (as if my arm is above my head) (I/V15). The impact that a known rotator cuff tear has upon activities of daily living, leisure activities and occupation were described by patients. The emotional impact, financial impact and impact upon caring roles described by participants and their lives were also emphasized and are presented. “I’ve always done things, I’ve done what I want to do and then suddenly that element’s taken out. What do I do?.....I can’t even do boring things that I hate that my wife likes me to do!.........I was bored witless…….And that (my usual life) was gone. It drove me up the wall.” (I/V 6). Rotator cuff tears also negatively influenced participant’s leisure activities. Participant’s halted leisure activities if advised to by health care professionals “I used to do an awful lot of cross stitch, she told me not to do that” (I/V1), or if activities became impossible “I couldn’t play tennis, absolutely out of the question, I couldn’t even lift the racquet up” (I/V11). People who had played sport “for decades” (I/V11) found the inability to continue these was hugely detrimental. One participant, who had played golf with his friends for over 30 years, spoke of losing this, and the time with his friends, and how he was reduced to spending his time doing jigsaw puzzles alone instead (I/V 6). Returning to golf, after he later had surgery, was immensely valued. Some people found that they could retain their leisure activities with the assistance of others, e.g. to land their fish during fishing (I/V 2). Fishing was the most frequently affected activity described by male participants in this study I/V 2,9,12) because of the need to cast the line, but as the cross stitch example indicates, both sporting and non-sporting leisure activities could be affected. The success of this lead to subsequent part time paid employment in the same organisation. For the few participants who were self-employed, rotator cuff tears could cause business worries, “It was quite stressful because of the worry…..what is going to happen to the business (I/V 12) and “I had a lot of work on at the time and I was trying to get through that” (I/V 20). One participant and his business partner took out additional sickness insurance following, and solely due to, his experience of rotator cuff tear. “I was getting to the point where I thought I might take a lot of tablets and just not bother waking up, yeah I did get that bad” (I/V3). This strength of expressed feeling by some participants is beyond that found in previous shoulder studies[12, 15]. It is starting to be recognised that depression and anxiety negatively impact upon outcome after rotator cuff repair and require greater attention from clinicians. In addition to being “depressing” (I/V 3, 15) and feeling “awful” (I/V6) many participants felt they became “edgy, short tempered” (I/V5) and “horrible to live with” (I/V 14) due to pain and lack of sleep. One participant spoke about re-injuring his shoulder when he thought it was improving and the realisation that “I really can’t deal with this anymore” (I/V13). Another spoke of feeling “dragged down when you have a pain that won’t go away (I/V 19) whilst another found the impact of reduced function “very frustrating and extremely unhappy” (I/V18). Several participants felt “people don’t believe you” (I/V 3), generally this did not refer to close family members but health care professionals or work colleagues or people known socially (I/V3, 14). “to try and get it (shoulder treatment) quick, I went private…..he (surgeon) gave me a minimal examination and didn’t really talk to me…….he charged me quite a lot of money for being in his office for 10 minutes” (I/V20). The exception to this was one participant whose previous good experience with his physiotherapist, meant he didn’t hold it against them when diagnosis and treatment was unsuccessful on this occasion (I/V 11). Participants mentioned how living with a rotator cuff tear was assisted by having a partner/carer who could help them do activities such as using “can openers and peeling potatoes” (I/V 3). However, if the participant was the carer for someone else, then the ramifications and impact of a rotator cuff tear could impact upon their ability to continue their caring roles. Two participants had spouses who used wheelchairs, and manoeuvring the chair up kerbs and on uneven ground became problematic. As one participant put it, a symptomatic rotator cuff tear “it’s got to affect the whole family, not just the person that it is happening to” (I/V15). The long term lived experience and nature of tears lead participants to believe that “if you still want to do things, you can’t let it (cuff tear) get in the way too much” (I/V 9). One participant though used distraction, rather than acceptance, to cope by using mediation and spending time with other people out and about (I/V 8). Overall however, there was a general view that people with rotator cuff tears had to appreciate the limitations of their shoulder now “it’s a matter of knowing how far you can go……..I know my limits” (I/V 17) and balancing getting on with life whilst restricting pain-provoking movements. “I really don’t want to go through that again…it really was such a bad time, the pain was unbelievably bad” (I/V 1). “I am still physically active, I still do what I can, but I’m very careful what I do” (I/V 17). The intensity of symptoms and wide-ranging impact of symptomatic rotator cuff tears on all areas of life were described by study participants. Like frozen shoulder, painful shoulders with rotator cuff tears are hugely disruptive to people’s lives. This supports the validity of the use of some or all of these components; pain, emotional, work, social, in well-designed Patient Related Outcome Measures (eg. DASH[23, 24], WORC, RCQoL,OSS[27, 28]) used in shoulder studies. These measures seek to quantify what is ‘heard’ qualitatively in this study. The Study participants described rotator cuff pain, and its impact, differently than people with other long term musculoskeletal pain conditions. Chronic pain is often described as episodic and unpredictable in nature, with ‘good days and bad days’. Here, study participants spoke about learning consequences: certain specific movements/activities were perceived as causing certain symptoms (predominantly pain) for a certain time period. Participants weighed up cause and effect in a balancing act that was often conscious “If I do X movement/activity then I will suffer Y in consequence for Z time”. This provided participants with an element of choice; comments such as “I know my limits” and let participants decide whether to remain within their limits or knowingly choose to do something risky or pain provoking. The question arises whether shoulder patients are able to link activity to symptoms in limbs, in a way that patients with central/torso pain cannot achieve, and thus avoid provoking pain by modifying movements. If symptoms changed over time, patients usually described adapting the balancing process accordingly. The exceptions to this seemed to be either movements/activities which participants had adapted so successfully that they continued them (such as using a computer mouse in their other hand), or movements/activities that participants perceived as remaining so risky and unsafe that they avoided them to lessen the risk of further/future cuff tears (eg reaching behind to pick up something on the back car seat). Participants in this study had all been referred to hospital orthopaedic departments due to the severity of their condition. It has previously been demonstrated that patients with higher functional disability have lower quality of life. The experiences of people with less severe symptoms, or whose symptoms have settled/eased over time or whose tears have responded well to treatment in primary care may be very different. Additionally, interviews were taken part after participants had completed their participation in the UKUFF trial; the time delay and any subsequent treatments may retrospectively have influenced or nuanced participants’ views. Rotator cuff pain is associated with cuff degeneration and aging yet the demands for higher levels of shoulder function later in life are increasing, due to factors such as the rising UK retirement age and the continuation of occupational and leisure activities later in life. Recently, the mismatch between clinician’s and patients perceptions of shoulder pain was highlighted. As previously with frozen shoulder, people living with rotator cuff tears described these in terms of a ‘biographically disruptive event[15, 31] which clinicians need to recognise and fully appreciate. Clinicians need to appreciate and understand the intensity and shocking nature of pain that may be experienced by participants with known rotator cuff tears and understand the detrimental impact tears can have upon all areas of patient’s lives. Clinicians also need to be aware of the potential emotional impact caused by cuff tears and to ensure that patients needing help for conditions such as depression are speedily identified and provided with support, explanation and appropriate treatment. Conservative and surgical treatments of symptomatic rotator cuff tear aim to relieve pain, however, further research concerning the management of pain for this patient group appears indicated by this study. The assistance of the UKUFF trial team and Principal Investigators in identifying and approaching potential participants is gratefully acknowledged. The study was funded by The Chartered Society of Physiotherapy Charitable Trust. All authors contributed to the design and co-ordination of the study. Catherine Minns Lowe carried out the interviews, led the data analyses and drafted and revised the manuscript. Jane Moser peer reviewed the data analyses and critically commented upon the important intellectual content of the manuscript. Karen Barker independently coded transcripts, peer reviewed the data analyses, was responsible for the study’s Research Governance and critically commented upon the manuscript. All authors read and approved the final manuscript.